Nintendo has confirmed that it is releasing new 3DS XL hardware bundles in Japan, with Animal Crossing and New Super Mario Bros. 2 themed consoles expected to hit store shelves in November. 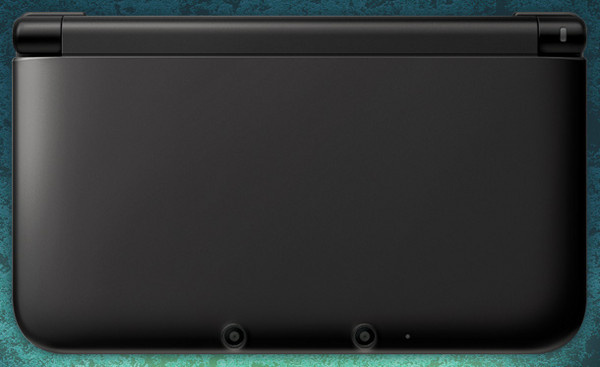 At the start of November Nintendo will push the all-black 3DS XL onto store shelves for 18,900 yen ($240 / £150). That's just the console on its own, without a game. Alongside this will be a Monster Hunter Tri G (AKA Monster Hunter 3 Ultimate) bundle, which carries a retail price of 21,800 yen ($280 / £170) and comes with a copy of the game. November 8th marks the launch of the Animal Crossing bundle at 22,800 yen ($292 / £180), while the 15th will see a New Super Mario Bros. 2 3DS XL hit stores shelves for the same price. Interestingly, the games bundled with these machines won't be physical copies, but digital versions installed on each machine's 4 GB SDHC card. There's currently no word on whether or not these limited edition systems will see the light of day outside of Japan, but when we know, you'll know. Animal Crossing 3DS XL, anyone? Way to 'dotty' IMO. Looks cluttered. The fully black one looks okay though. The Mario one's pretty cool... But I'm happy with my blue one. The animal crossing one could've been better. sigh I knew I should have waited for something like this, that NSMB2 is perfect! Damn you impatience! I like the Mario one, it's pretty cool. I might get one if they come here. I want the Animal Crossing one! Sure, it's certainly not the best design, but it's one that I'm more than happy to settle for if they decide to release it in Australia as I want to get an XL but I'm not fond of any of the plain Jane designs that they've released here. 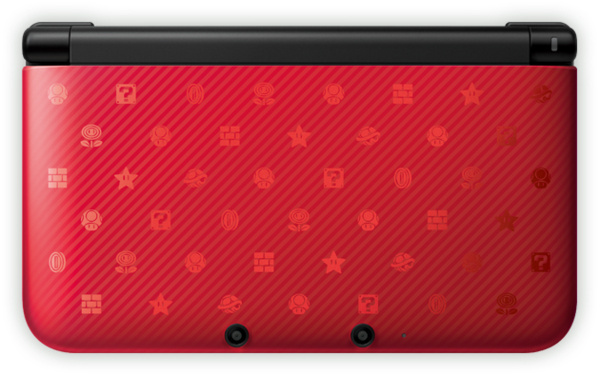 I really dig the Mario one, even if it's just a glorified red 3DS XL. A friend of mine told me he wanted to wait on the 3DS XL in hopes of getting a cool looking special edition console. Looks like we have our answers! The Animal Crossing One should've been green, like that well known grass texture. But I do really like the looks of the Mario one and the Black one. Diagonal stripes are awesome. Uh...shouldn't the NSMB2 one be gold? Why did Nintendo make it red when the whole focus on the game is gold? As much as I like Animal Crossing that design is kinda blah. The NSMB2 design looks really nice though. oh that animal crossing design is awesome. and the mario one too. and the allblack one too!!! I love my Silver XL but the only way I'll get a new XL is if they release a limited edition Majora's Mask one. ANIMAL CROSSING, Y U NO IN AMERICA YET?!?!?!?!? The Animal crossing one could be better but the NSMB2 one looks very nice, I'm fine with my aqua blue 3DS though. Why is Monochrome racing listed as a related game? That has nothing to do with this article. Both look nicer than my current 3DS, I really want an XL eventually. I wanted the Animal Crossing one until I saw the design. You can keep that, Japan. Leave it to Nintendo Of Japan to do something bizarre like this with an Animal Crossing themed Nintendo 3DS. I can't really complain about the design, it looks a bit colorful, but it just seems like it's missing more. As for the New Super Mario Bros. 2 themed 3DS , that one SHOULD HAVE BEEN GOLD!! I agree with GamerZack about that. I mean, wasn't the whole purpose of that game to collect a whole mess of coins Nintendo huh? Until I looked @ the enlarged image, the AC design thumbnail looked to me like multicolored polka-dots on a white bg(background), which I though was pretty neat looking, or multicolored confetti, like party confetti. Then I seen, in the enlarged thumbnail it's symbols from AC, w/ grey dots thrown in, or possibly it's supposed to look like those ground textures. It's still nice. The black, I suppose, is to cater to the plain-color lovers. The NSMB2 one, while it is interesting that they didn't choose a gold pattern/plain color design, the red more easily, & readily says "Mario". For me, I really like the pattern, as it reminds me, of the sky from SMB3, which had white item/power-up silhouettes in it. For Christmas last year, I got the Cosmo black, which I like. 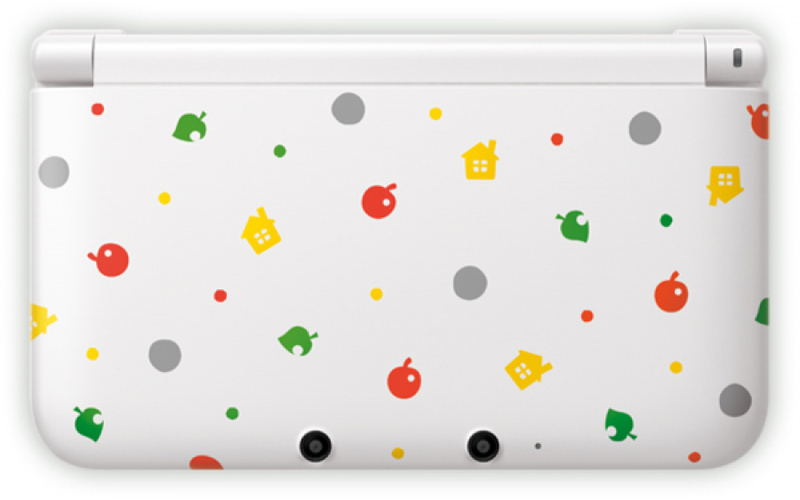 So, I don't really need another, & If I got another (3DS), I would love to get a special edition design. If these don't officially make it to NA, my guess is you'll see online, ppl selling custom-modified NA-region 3DS, w/ these editions' shells replacing our commercially currently available 3DS systems' outer shells. Or you'll just see importers. But, I suspect you'll see both. 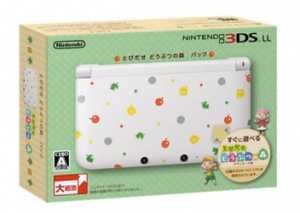 Too bad the Animal Crossing bundle comes with a white 3DS, those look like fisher price toys . None of the designs seem very impressive to me considering what they could have done. WOAH, that Animal Crossing 3DS is beautiful! Hey something that the rest of the world will never get! i like the red mario based one the most. i think the animal crossing one could've been a lot better. I don't like the AC one because it is white. Now Nintendo could've done something creative and made a Gold one for NSMB2. I like the red one but I have the red DSi XL. I will get a 3DS XL, hopefully the silver or special edition of MH3U comes. Hope the Mario 3DS XL comes North America at some point. Maybe Black Friday? Otherwise I agree that the Animal Crossing one looks a bit off. Probably just cause I'm a girl, I love the Animal Crossing one. The pattern is really cute. However, I wouldn't get it if they released it here. There's no point in getting a second 3DS. The AC one is too messy to me, theres just too many different shapes and colors going on. I would rather it be a ground pattern or maybe a leaf pattern. I'm happy with my aqua 3Ds though so I wouldn't get one anyway, being a little bigger or having a fancy paint job isn't enough of a reason to upgrade to me. The Mario-themed 3DS XL is making me drool! Am I the only one who looked at the Animal Crossing 3DS photo on top, and immediately thought someone made a Pop-Tarts 3DS? Surely we'll get at least one new color in North America in time for the holiday season, right? ...Right? The black one and the Mario one look pretty nice. It would have been nice to see a bit of gold on the Mario one (maybe have the icons done in gold). I still think I would prefer the silver, but I would happily welcome the black one into my family of handhelds. Japanese people are so freaking lucky! Lovin' the Animal Crossing one.